This document describes the internal workings of the MCJIT execution engine and the RuntimeDyld component. 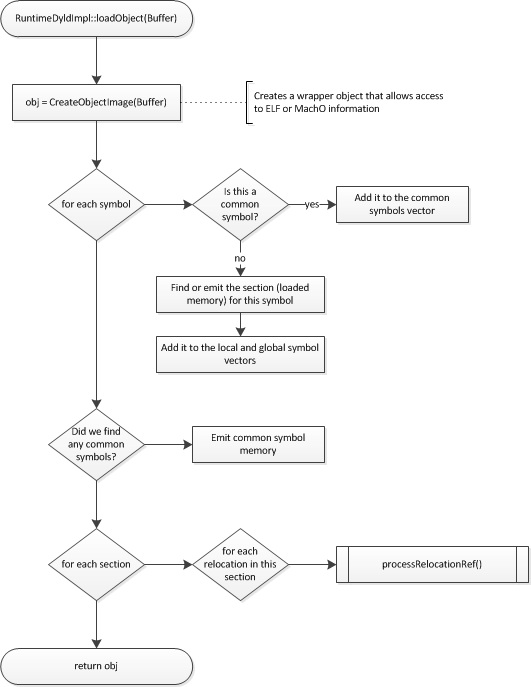 It is intended as a high level overview of the implementation, showing the flow and interactions of objects throughout the code generation and dynamic loading process. In most cases, an EngineBuilder object is used to create an instance of the MCJIT execution engine. The EngineBuilder takes an llvm::Module object as an argument to its constructor. The client may then set various options that we control the later be passed along to the MCJIT engine, including the selection of MCJIT as the engine type to be created. Of particular interest is the EngineBuilder::setMCJITMemoryManager function. If the client does not explicitly create a memory manager at this time, a default memory manager (specifically SectionMemoryManager) will be created when the MCJIT engine is instantiated. Once the options have been set, a client calls EngineBuilder::create to create an instance of the MCJIT engine. If the client does not use the form of this function that takes a TargetMachine as a parameter, a new TargetMachine will be created based on the target triple associated with the Module that was used to create the EngineBuilder. 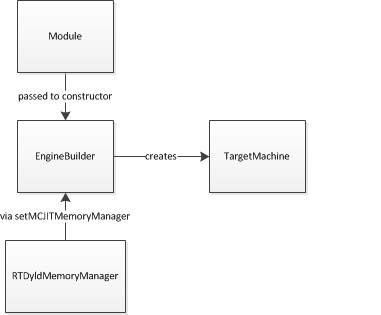 EngineBuilder::create will call the static MCJIT::createJIT function, passing in its pointers to the module, memory manager and target machine objects, all of which will subsequently be owned by the MCJIT object. The MCJIT class has a member variable, Dyld, which contains an instance of the RuntimeDyld wrapper class. 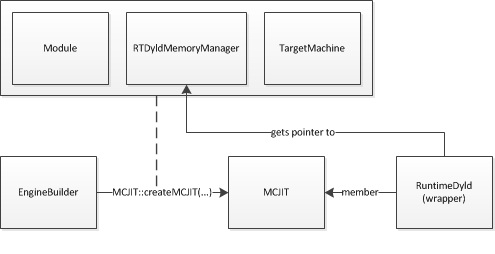 This member will be used for communications between MCJIT and the actual RuntimeDyldImpl object that gets created when an object is loaded. Upon creation, MCJIT holds a pointer to the Module object that it received from EngineBuilder but it does not immediately generate code for this module. Code generation is deferred until either the MCJIT::finalizeObject method is called explicitly or a function such as MCJIT::getPointerToFunction is called which requires the code to have been generated. When code generation is triggered, as described above, MCJIT will first attempt to retrieve an object image from its ObjectCache member, if one has been set. If a cached object image cannot be retrieved, MCJIT will call its emitObject method. MCJIT::emitObject uses a local PassManager instance and creates a new ObjectBufferStream instance, both of which it passes to TargetMachine::addPassesToEmitMC before calling PassManager::run on the Module with which it was created. 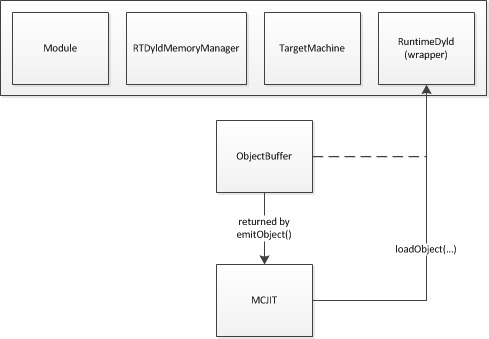 The PassManager::run call causes the MC code generation mechanisms to emit a complete relocatable binary object image (either in either ELF or MachO format, depending on the target) into the ObjectBufferStream object, which is flushed to complete the process. If an ObjectCache is being used, the image will be passed to the ObjectCache here. At this point, the ObjectBufferStream contains the raw object image. Before the code can be executed, the code and data sections from this image must be loaded into suitable memory, relocations must be applied and memory permission and code cache invalidation (if required) must be completed. Once an object image has been obtained, either through code generation or having been retrieved from an ObjectCache, it is passed to RuntimeDyld to be loaded. The RuntimeDyld wrapper class examines the object to determine its file format and creates an instance of either RuntimeDyldELF or RuntimeDyldMachO (both of which derive from the RuntimeDyldImpl base class) and calls the RuntimeDyldImpl::loadObject method to perform that actual loading. RuntimeDyldImpl::loadObject begins by creating an ObjectImage instance from the ObjectBuffer it received. ObjectImage, which wraps the ObjectFile class, is a helper class which parses the binary object image and provides access to the information contained in the format-specific headers, including section, symbol and relocation information. RuntimeDyldImpl::loadObject then iterates through the symbols in the image. Information about common symbols is collected for later use. For each function or data symbol, the associated section is loaded into memory and the symbol is stored in a symbol table map data structure. When the iteration is complete, a section is emitted for the common symbols. Next, RuntimeDyldImpl::loadObject iterates through the sections in the object image and for each section iterates through the relocations for that sections. For each relocation, it calls the format-specific processRelocationRef method, which will examine the relocation and store it in one of two data structures, a section-based relocation list map and an external symbol relocation map. When RuntimeDyldImpl::loadObject returns, all of the code and data sections for the object will have been loaded into memory allocated by the memory manager and relocation information will have been prepared, but the relocations have not yet been applied and the generated code is still not ready to be executed. At any time after initial code has been generated and before finalizeObject is called, the client can remap the address of sections in the object. Typically this is done because the code was generated for an external process and is being mapped into that process’ address space. The client remaps the section address by calling MCJIT::mapSectionAddress. This should happen before the section memory is copied to its new location. When MCJIT::mapSectionAddress is called, MCJIT passes the call on to RuntimeDyldImpl (via its Dyld member). RuntimeDyldImpl stores the new address in an internal data structure but does not update the code at this time, since other sections are likely to change. When the client is finished remapping section addresses, it will call MCJIT::finalizeObject to complete the remapping process. When MCJIT::finalizeObject is called, MCJIT calls RuntimeDyld::resolveRelocations. This function will attempt to locate any external symbols and then apply all relocations for the object. External symbols are resolved by calling the memory manager’s getPointerToNamedFunction method. The memory manager will return the address of the requested symbol in the target address space. (Note, this may not be a valid pointer in the host process.) 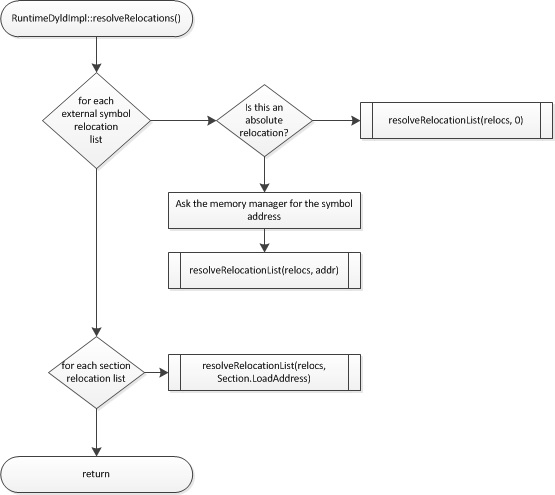 RuntimeDyld will then iterate through the list of relocations it has stored which are associated with this symbol and invoke the resolveRelocation method which, through an format-specific implementation, will apply the relocation to the loaded section memory. Next, RuntimeDyld::resolveRelocations iterates through the list of sections and for each section iterates through a list of relocations that have been saved which reference that symbol and call resolveRelocation for each entry in this list. The relocation list here is a list of relocations for which the symbol associated with the relocation is located in the section associated with the list. Each of these locations will have a target location at which the relocation will be applied that is likely located in a different section. 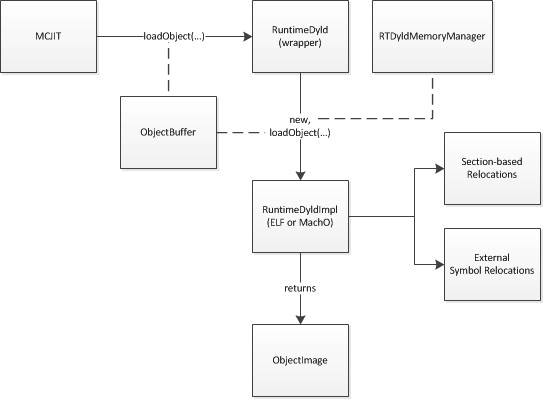 Once relocations have been applied as described above, MCJIT calls RuntimeDyld::getEHFrameSection, and if a non-zero result is returned passes the section data to the memory manager’s registerEHFrames method. This allows the memory manager to call any desired target-specific functions, such as registering the EH frame information with a debugger. Finally, MCJIT calls the memory manager’s finalizeMemory method. In this method, the memory manager will invalidate the target code cache, if necessary, and apply final permissions to the memory pages it has allocated for code and data memory.